Scrap Dreams: How To Make a Meal They Will ALL Eat! 1. 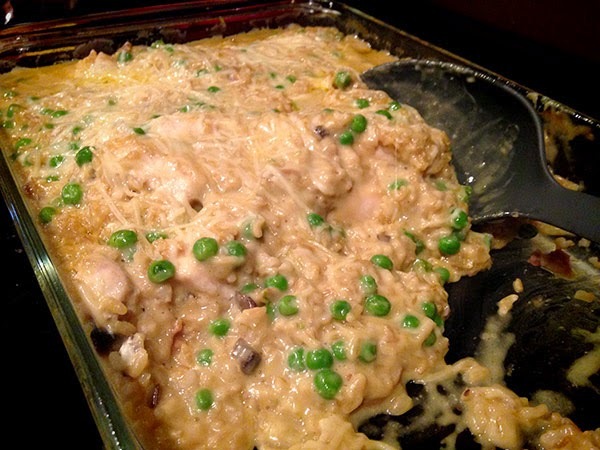 Start out with a complicated Chicken & Wild Rice Casserole recipe that doesn't quite please your family. 2. On the second try, ditch the Uncle Ben's wild rice with the overwhelming flavor packets and too much salt in favor of plain brown rice. Much better! 3. On the third try, change the milk to heavy cream and the Dry Sherry to Marsala wine. Definitely improved the flavor and made the casserole much more creamy. Also realize that the instructions calling for layering the ingredients in a pan are just stupid and mix it all together in a bowl then dump in the pan. So much easier! Cut about 10 minutes out of the prep time and it cooks better. 4. On the fourth try, add peas. Ask yourself why this recipe didn't have peas in it to begin with? Seriously, what was the author thinking? 5. Remember to take a picture after you have already started serving dinner. 6. End up with a custom secret family recipe that everyone loves and that you can share with your blog friends! (P.S. This makes awesome leftovers). And in this version I added an extra can of mushrooms. Just cause I was in the mood! Bake for an additional 15-20 minutes or until cheese is melted. It looks like a lovely creamy risotto. The bonus being no standing over the stove stirring for ever! Definitely something my husband will like! I admire the number of attempts you've made at this and your determination to keep improving it! Recipe sounds wonderful! If it had been me and I didn't like it on the first try, I'd have ditched the recipe. I am NOT good at changing ingredients simply because I don't know what to substitute. Bravo to you!! Looks yum. Anything that can be dumped in a pan and stirred is a winner in my books, bonus if they eat it all! This sounds great....though I'll try it with cream of chicken soup due to a mushroom hating daughter! This looks great! We can not eat can soup due to some allergies so I'll have to try this with my "cream of something" mix and see what happens. I need more quick easy meals on my meal plan. YUM - And what a totally FUN how-to post!